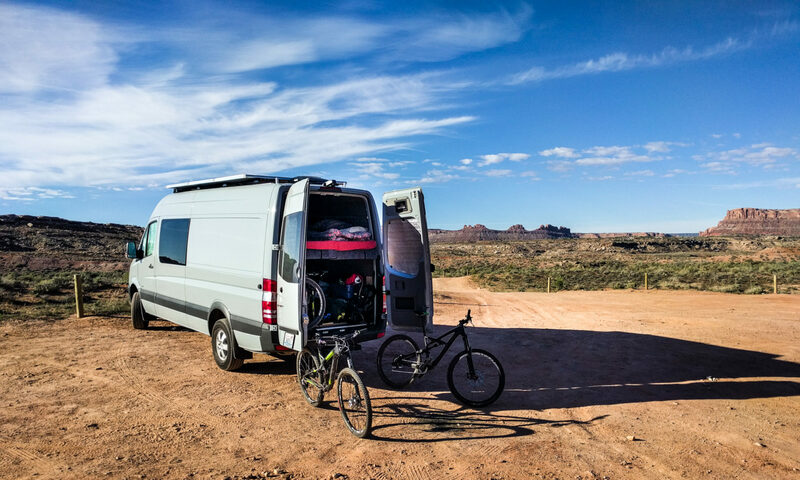 If you have an alarm in your Sprinter, or if you specified the overhead cubby option, there’s a neat source of power you can hook in to for things like dash cams or equipment that would fit in the DIN cubby hole. We’ve been running a dash cam/rear view camera setup for a while now. It’s been plugged into one of our 12v outlets on the house battery system. That means we have to remember to turn it on and off each time we drive. 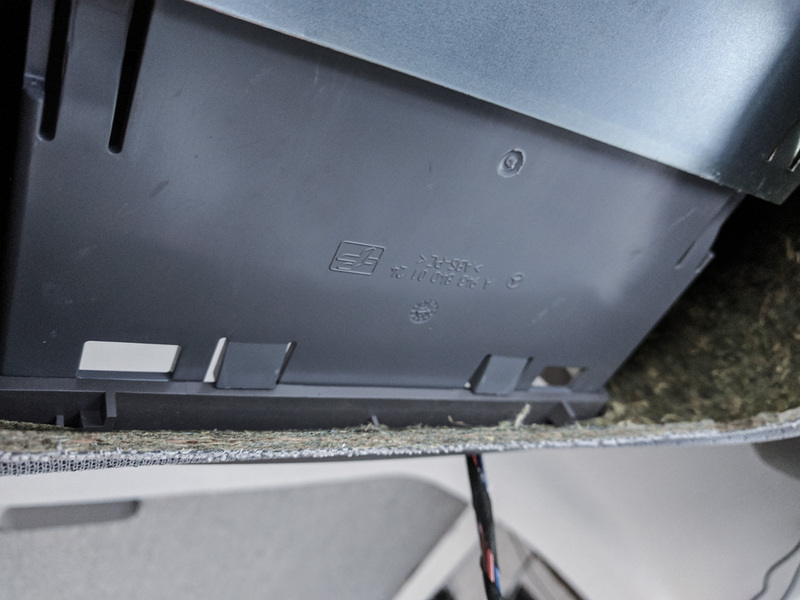 We finally got around to exploring the Mercedes-provided power supply in the cubby above the center light console in the cab area headliner. You may or may not have this cubby. It comes on vans with an alarm option and it’s also something you can specify as an option. It’ll be pretty obvious if you do have it, because you’ll have a 1 DIN (radio) sized plastic cover above the area where the reading lights are in the cab headliner. To get to the power supply, you just have to lever off the front panel by inserting a trim tool into the side. Inside, you should find a four-conductor cable bundle. Ignore the other wires in this image – they are ones we added early in the build when we had the headliner out and before we put the wall panels on. 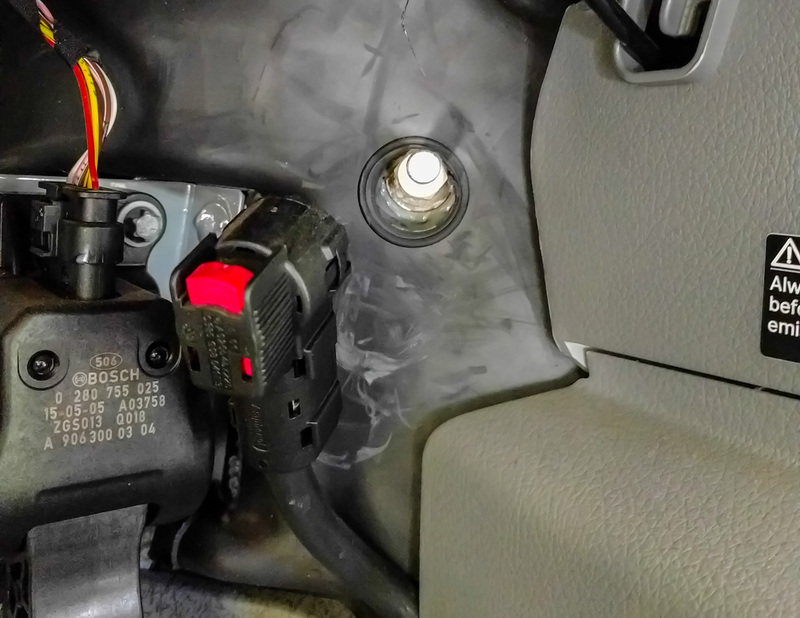 The red always-on wire is fused in F55/2 position 4( that’s #13 on the lowest row of the footwell fuses under the driver’s dash area) with a 7.5A fuse. The other power wires in the bundle may be fused there, or on F55/5 position 1 (#19 in the fuse panel on the outside edge of the driver’s seat base), which is either a 5A fuse or 25A if you have alarm system. 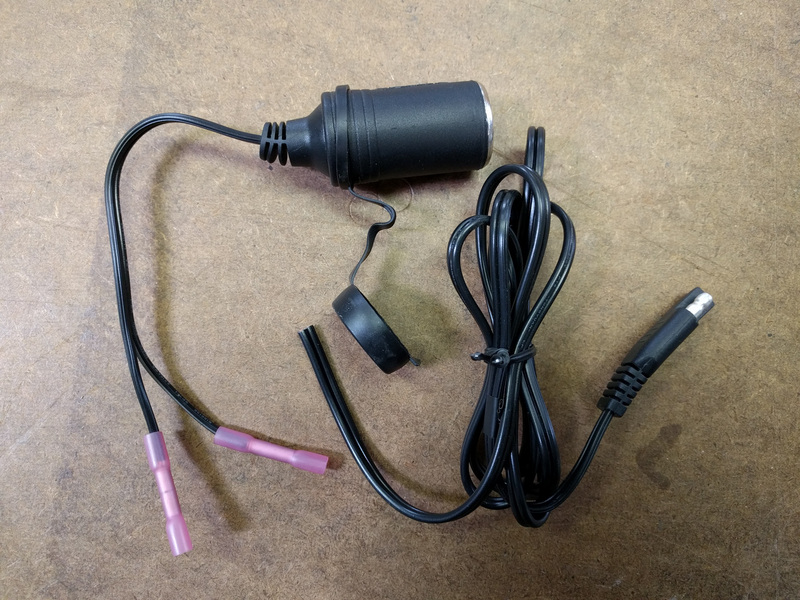 The dash camera that we wanted to power has a 12v cigarette lighter plug adapter. We decided that the easiest way to attach it to the power source was via a cigarette lighter socket adapter. We bought a Battery Tender Cigarette Adaptor for Quick Disconnect because it had heavy enough gauge wires (18 gauge) and was cheaper than some of the other options out there. We cut the quick disconnect end off, and crimped on some cable connectors. If you wanted to expose the power source through the cover on the cubby, you could always use one of the Blue Sea 12v dash sockets instead. We’ve used them throughout our build and they are solid. Next step was to wire this in to the cubby area. First we disconnected the battery using the terminal in the driver footwell next to the accelerator pedal. You’ll be cutting through power cables. 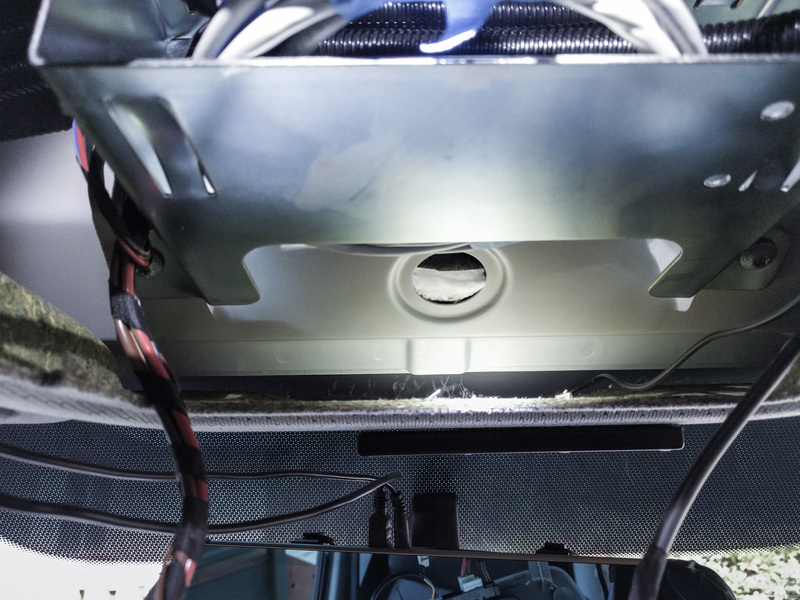 Be safe rather than sorry – unclip the main power supply next to the accelerator pedal. 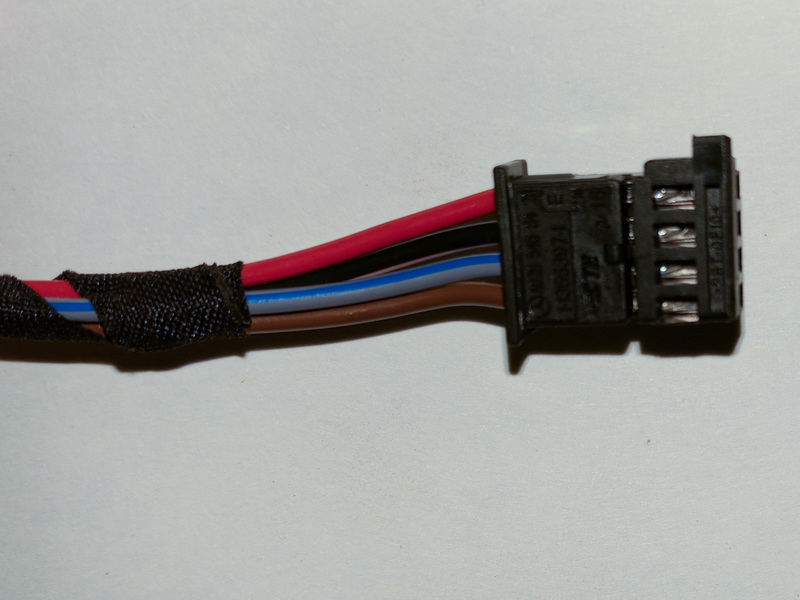 We could have searched around for a matching connector for the Mercedes plug, but it’s designed to be attached to a header on a printed circuit board so not an easy thing to match up. Instead, we just cut the wires. We intended to use the grey/blue “engine on” wire. However in our van that wire did not have power. We don’t know why and visually inspecting the parts we could see didn’t show any damage. It’s something that we might troubleshoot later, but for now we just used the black/pink “ignition on” wire instead. We crimped the cigarette adapter on to the cables after double checking that we had the positive center conductor connected to the black/pink wire and the negative ring conductor connected to the brown wire. On our adapter, the positive wire had an extra raised line moulded into it along its length. Even if yours doesn’t, it’s easy to test using the continuity setting on a multimeter. The wire crimps we used are made of heat shrink material. A quick blast with the heat gun and we were good to go. One of the reasons for doing this whole job was to get rid of the wires that were dangling around the cab area. 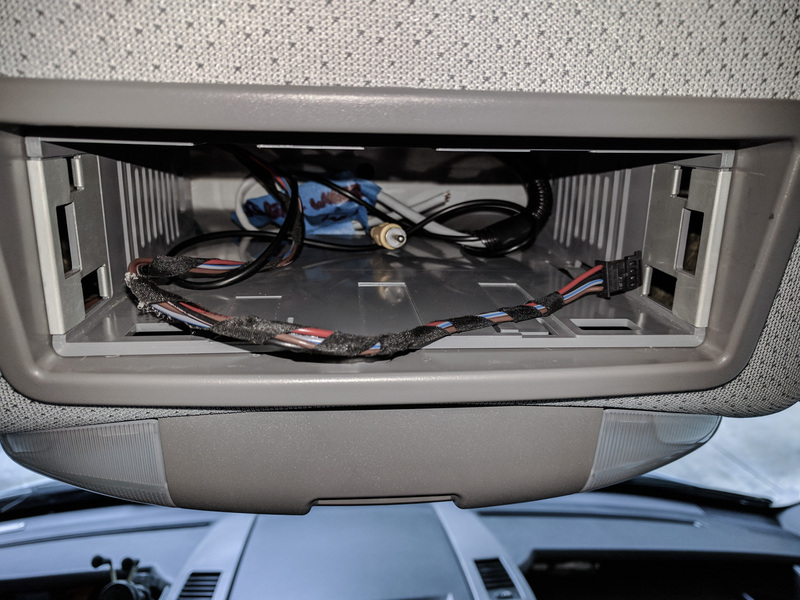 It was easy to run the power cable for the mirror-mounted dash cam forward from the cubby so that it popped out at the front of the cab headliner. First, we removed the courtesy light cluster. 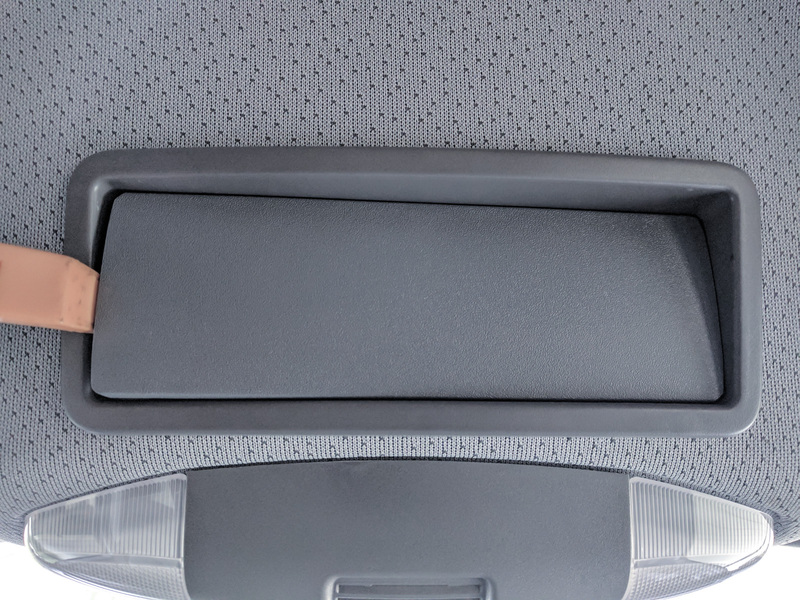 That’s pretty simple when you know the trick – use a trim tool to push in the two metal springs on the passenger side of the cluster. Then, hinge it down and pull it to the passenger side of the van to free up the two plastic tabs holding it in place on the driver’s side. Now you have a big hole that’s really useful for accessing the inside of the cab headliner area. If you need to work on your antenna, this is how you access the bolt that holds it on to the roof. In this instance, you’ll find it easy to remove the plastic insert for the cubby. If you look up into the hole, you’ll see the retaining clips at the bottom of the plastic cubby insert. There are identical ones on the top too. 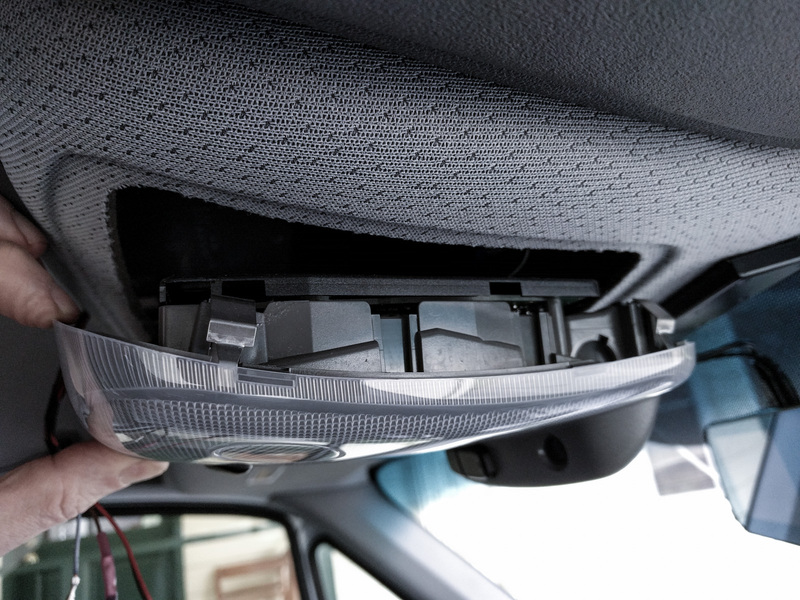 You can use a trim tool to push them in and then slide the plastic insert towards the rear of the van. The plastic cubby insert has tabs at the bottom and top to hold it in place. Push them in to remove the insert. Now you’ll see the metal bracket that really supports the weight of anything you add to the cubby area. You’ll also see how easy it is to thread a cable from here to the front of the headliner just above the rear view mirror. We took this opportunity to use a wire fish to push the video cable through from the back edge of the cab headliner into this area as well. Then we could thread it through with the power cable down to the rear view mirror. 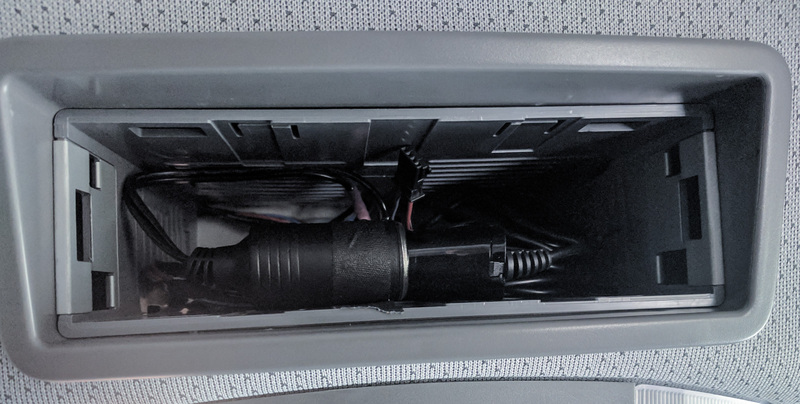 After you’ve pushed your cable through the headliner, reinstall the plastic cubby insert and the courtesy light cluster, but be sure to get the cable threaded through everything in the right place so that it’s still accessible when all the pieces are reassembled. The cigarette adaptor and power source in place in the cubby. We taped the whole thing down so it doesn’t rattle while we’re driving. Now we’ve made this change, the dash cam comes on when you turn the ignition to the second position and it turns itself off a couple of seconds after you remove the key. Mission accomplished. Thank yo so much for this detailed write up. i searched many pages and sites for about 2 hours trying to find a connector or at least figure out which was the accessory power wire. i wired a review camera since the 2006 didnt have one. now i just need to figure a mount. Chad, you’re welcome. Have fun with your new rear view camera!